We are back on the island of Koh Chang again and loving the slow pace of life on Lonely Beach This time around, we also wanted to explore a little more. One of the biggest drawbacks to staying on Lonely Beach is that it can get expensive using songthaews (pick up truck taxis) when you want to explore the rest of the island. Most people rent a motorbike but that wasn’t something I wanted to do with the baby since the roads near Lonely Beach have some very sharp turns and steep hills. We decided to go to Bang Bao Fishing Village for the afternoon as a truck taxi from Lonely Beach to Bang Bao was only 70 baht per person each way. Bang Bao Fishing Village. That is the pier in the distance. What was once a sleepy, little fishing village is now more of a tourist trap than anything else. The pier is lined with the souvenir shops selling the exact same stuff that you will see all over the island. 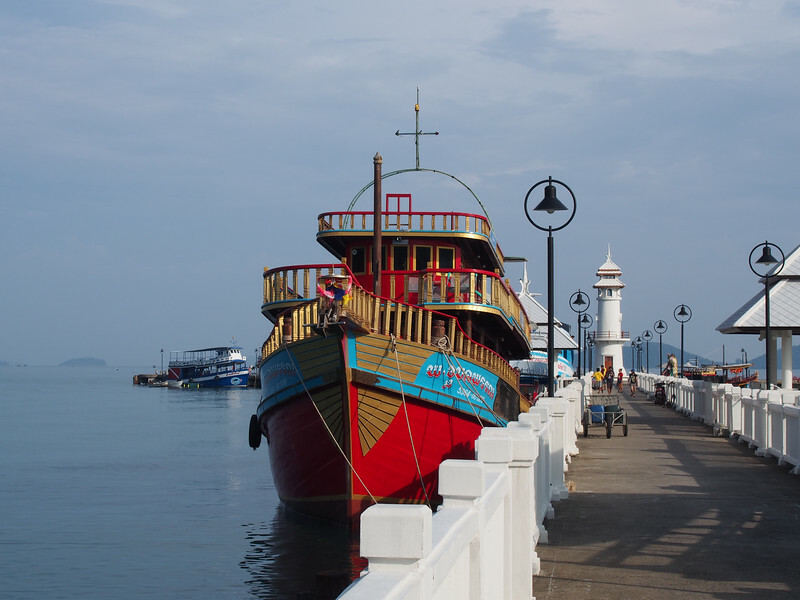 If you plan on taking any of the boat tours to nearby islands, many of them leave from the Bang Bao pier. 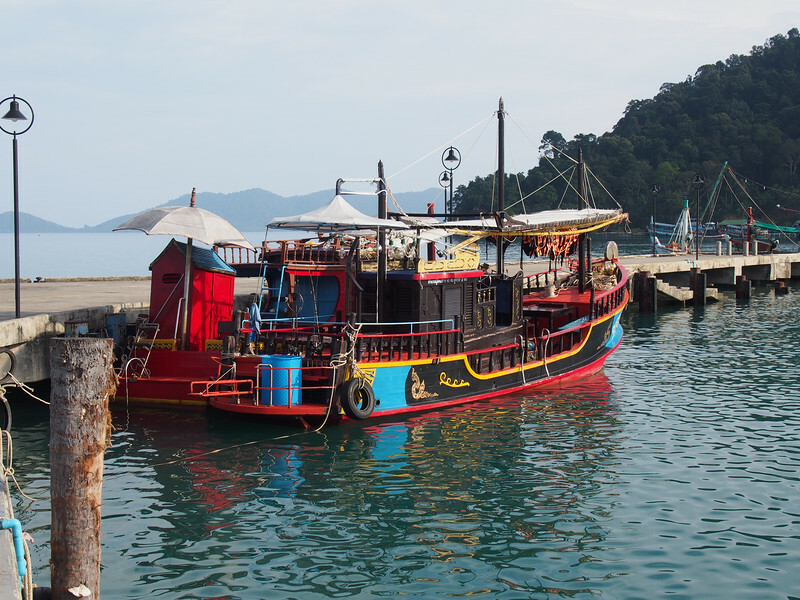 Colourful fishing boat off Bang Bao pier. Grilled squid for sale on the pier. After a quick walk to the end of the pier at back, there is not much else to do than sample some of the fresh seafood available along the pier. 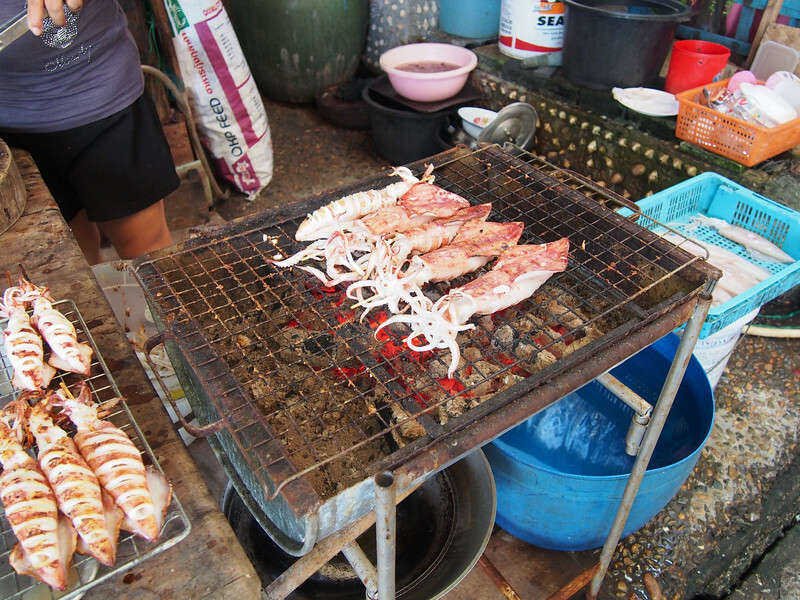 The grilled squid started at 60 baht each and were delicious with a bit of hot chili sauce. However, we wanted more than a snack and decided to have dinner at one of the seafood restaurants on the pier. 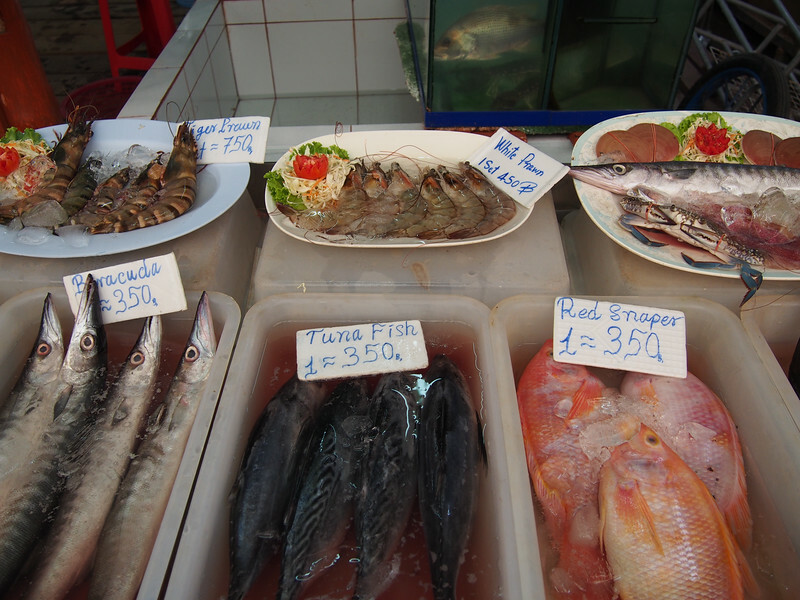 Seafood ready to be grilled at one of the restaurants along the Bang Bao pier. Prices were a little higher here than on Lonely Beach but not by much. 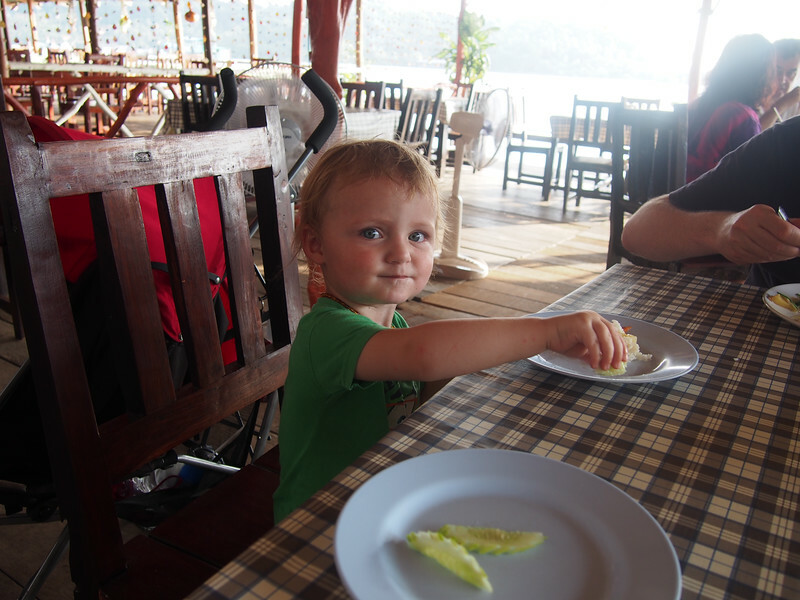 Little Nomad was happy with fried rice and eating half of my steamed crab! Steamed crab with black pepper at Nok Noi Restaurant . I had the crab with black pepper. 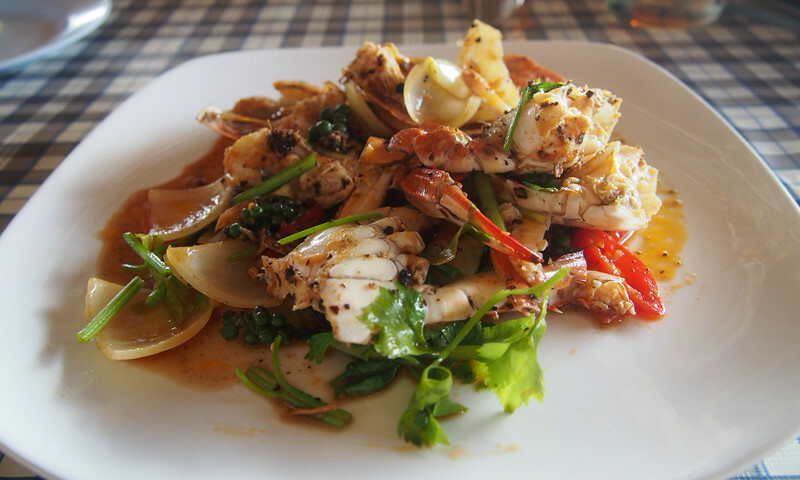 I have to say that it was much better than any of the pepper crab I’ve had in Cambodia which is supposed to have the best black pepper. These peppercorns had a sharp, bold flavour that really complemented the crab and woke up the palate. I tried asking the owner where the peppercorns were from but I only got a long story about how the dish I ordered was originally from China and not Thailand. It was not Cambodian pepper anyway. 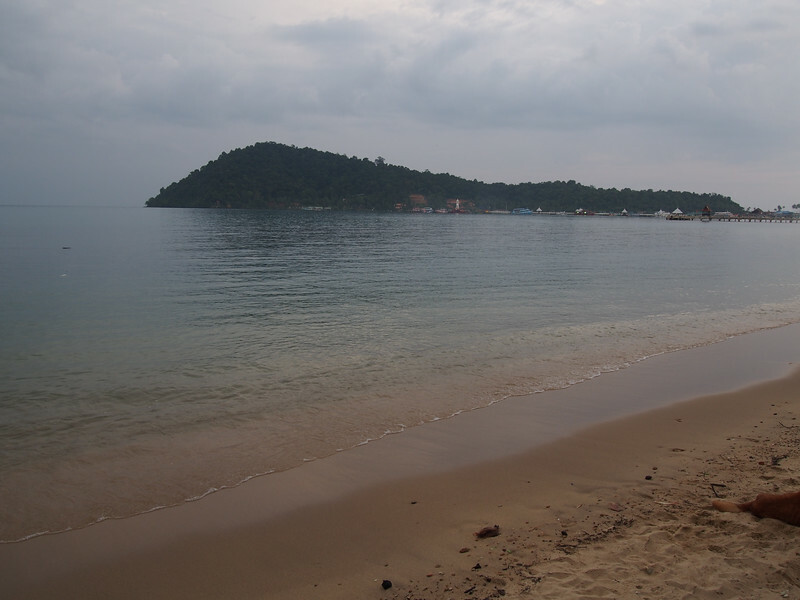 View from Hat Sai Noi Beach. Walking away from the Bang Bao pier, turn right on the main road and walk about 500 meters down the road. 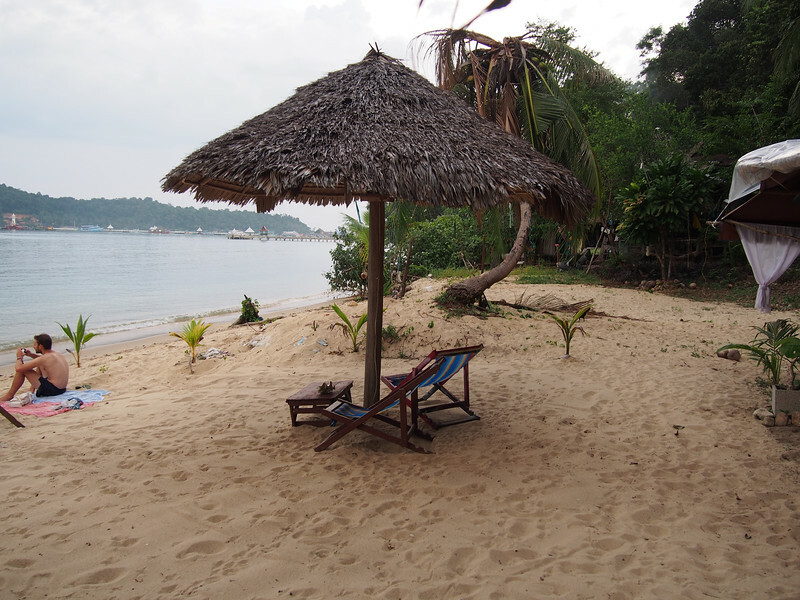 You will come to a small group of 4 beach bars surrounding a tiny stretch of beach called Hat Sai Noi (noi, little, sai, sand, hat, beach). I’m told that Djembe House has parties and live music sessions (drums and didgeridoos) on Friday nights but we were there on a late Saturday afternoon and the bars were quiet aside from the ever present reggae music and the sound of the water lapping the shore. There were only two other people sharing this little beach with us. Lovely spot. 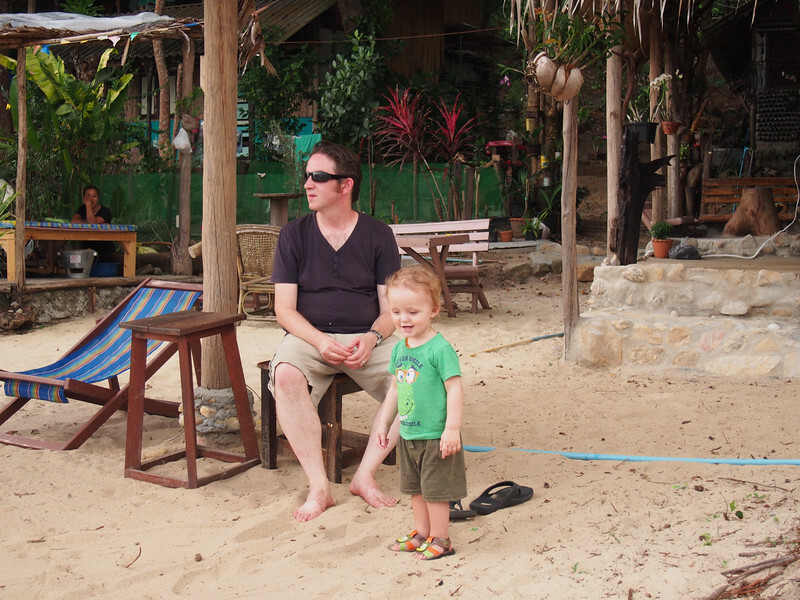 Micheal and Little Nomad relaxing on the beach. L.N. takes a break from dancing to reggae music. We ended up relaxing on Hat Sai Noi longer than we had planned. We didn’t want to push the pushchair back up to Bang Bao pier in the dark, so the woman at the bar of I Do, I Do rode her motorbike up to the pier to send a truck taxi back down for us. A few people were just beginning to drift into the beach bars as we left. 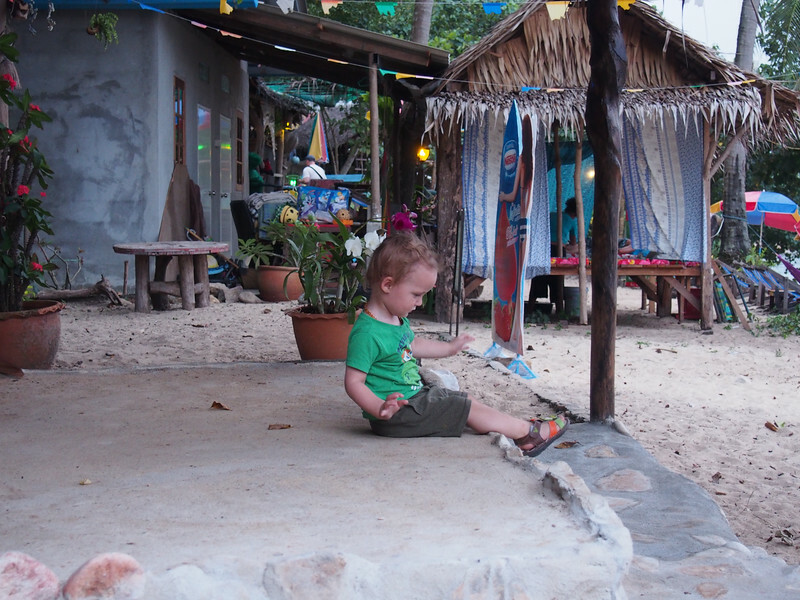 Hat Sai Noi is really a lovely little spot if you want to be away from the crowds on the larger beaches of Koh Chang. There is definitely a more laid back, bohemian vibe there. 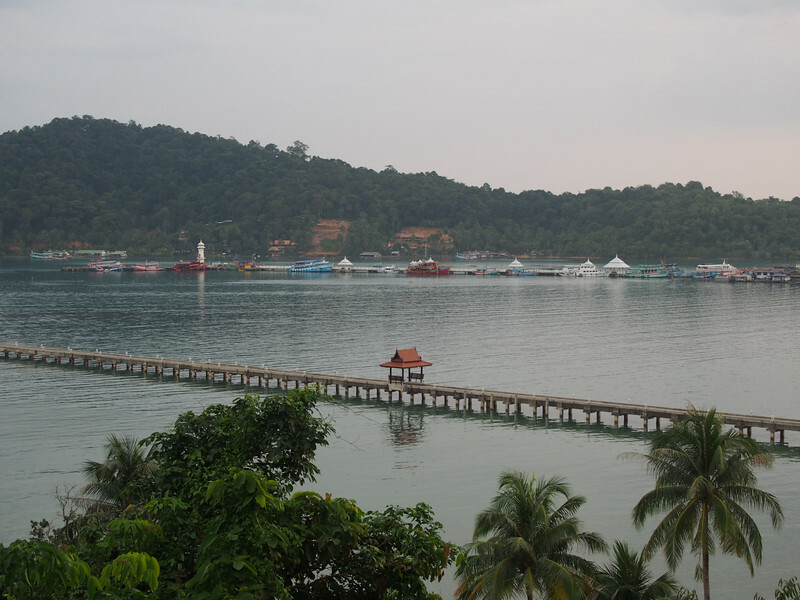 If that sounds like heaven to you, there are accomodation options ranging from the dirt cheap but very basic Hippy Hut to much more expensive resorts closer to Bang Bao pier. You will probably need to rent a scooter if you want to go anywhere else on the island as taxis do not usually go any farther than Bang Bao pier.